This article describes the results of large scale testing of Microsoft SharePoint Server 2010 that was performed at Microsoft. The results of the testing were used to publish requirements for scaling document archive repositories on SharePoint Server to a large storage capacity. The tests involved creating a large number of typical documents that have an average size of 256 KB, loading the documents into a SharePoint Server farm, creating a Microsoft FAST Search Server 2010 for SharePoint index on the documents, and then running tests with Microsoft Visual Studio 2010 Ultimate to simulate usage. This testing demonstrates both scale-up and scale-out techniques. Scale-up refers to using additional hardware capacity to increase resources of a single environment, which for these purposes means a SharePoint Server content database. A SharePoint Server content database contains all site collections, all metadata, and binary large objects (BLOBs) associated with those site collections that are accessed by SharePoint Server. Scale-out refers to having multiple environments, which for these purposes means using multiple SharePoint Server content databases. A content database consists of a SQL Server database, various configuration data, and any document BLOBs regardless of where the BLOBs are stored. The workload that was tested for this report is primarily about document archive. This includes a large number of typical Microsoft Office documents that are stored for archival purposes. Storage in this scenario is typically for the long term with infrequent access. This section describes the dataset, workloads, hardware settings, topology, and test definitions that were used during the large scale SharePoint Server testing. This load test was developed to show large document archive capabilities of SharePoint Server 2010. The document archive workload is characterized by having a large number of documents that are added to, or ingested, slowly, infrequently accessed and almost never updated. Content routing is recommended for a SharePoint Server 2010 farm that has multiple content databases. Content routing sends documents to the correct content database from an initial drop library. In the tests that are described in this report, content routing was not configured, and the focuses of the tests were scalability and performance of the installation. While content routing is used to ingest documents into one of multiple SharePoint Server 2010 content databases, Microsoft FAST Search Server 2010 for SharePoint can be used to optimally locate a document in one or more content databases. Microsoft FAST Search Server 2010 for SharePoint builds an index with all documents from all content databases. Searches can use metadata, refiners for selecting by date, author, or other properties. Full text searches can also be performed. This article presents the results of a series of performance tests that were conducted on SharePoint Server 2010 and Microsoft FAST Search Server 2010 for SharePoint in a document archive scenario. This section includes an explanation of the testing methodology that was used for tests. Deviations from this methodology are noted where data is presented. The specific capacity and performance figures presented in this article differ from the figures in real-world environments. The figures that are presented are intended to provide a starting point for the design of an appropriately scaled environment. After you complete your initial system design, test the configuration to determine whether your system will support the factors in your environment. Testing workloads were designed according to a large document archive storage scenario and are intended to help develop estimates of how different farm configurations are affected by using a large-scale document repository. The test farm depicted in this scenario was built to allow scale out and scale up to accommodate additional capacity as required. The ability to scale out or scale up is as important for small-scale implementations as it is for large-scale document archive scenarios. Scaling out allows you to add more servers to your farm (or farms), such as additional front end Web servers or Application Servers. By scaling up you increase the capacity of your existing servers by adding faster CPUs or memory, or both, to increase throughput and performance. Content routing should also be leveraged in archive scenarios so that users can drop a file and have it dynamically routed to the proper document library and folder, if applicable, based on the metadata of the file. This section defines the test transactions and other baseline settings, and provides an overview of the test process that was used for each scenario. Detailed information such as test results and specific parameters are given in later sections in this article. Upload a document to one of the Document Centers. One unique folder and file were created in each Document Center each hour, 24 hours a day. Access of a random Document Center home page, Document Library List view page, or Folder list view page. A random search query submitted to the FAST Search Center. The time between transactions for each user. This represents the time that a user spends reading or thinking between accesses to Web pages. The number of users who are connecting to the SharePoint Server farm from test agents to the SharePoint Server front-end Web servers. This does not represent a possible total user base, because in a typical environment a small proportion of total users will concurrently access the system. The length of time that the test is run. Whether Web caching is turned on for the front-end Web servers. Whether FAST Content indexing is operating during the test. Each test was started off with 1,000 users and ramped to the target user load in increments of 100 users. A 30 second ramp time was used and a 10 second step time. Visual Studio 2010 Ultimate was used to simulate the user transaction load. One test controller virtual machine and 19 test agent virtual machines were used to create this load. This section defines the test mixes that were used and provides an overview of the test results for each test mix scenario. The test mix that was used for each test varied, based on the particular test and load targets. All tests were conducted by using Visual Studio 2010 Ultimate and were recorded to code-free scripts that were generated exclusively by Visual Studio 2010. Specific data points for each test were populated, and then the test mix was run for different periods using different numbers of concurrent users to determine farm capacities and limits. All tests that were conducted in the lab were run using 10 seconds of think time. Think time is a feature of the Visual Studio 2010 Ultimate Test Controller that simulates the time that users pause between clicks on a page in a real-world environment. The mix of operations that was used to measure performance for this article is artificial. All results are only intended to illustrate performance characteristics in a controlled environment under a specific set of conditions. These test mixes are made up of an uncharacteristically high amount of list queries that consume a large amount of SQL Server resources compared to other operations. This was intended to provide a starting point for the design of an appropriately scaled environment. After you have completed your initial system design, test the configuration to determine whether your specific environmental variables and mix of operations will vary. This test series varies the number of users to see how the increased user load affects the system resources in the SharePoint Server and FAST Search Server 2010 for SharePoint farm. Three tests were performed including 4,000 users, 10,000 users, and 15,000 users. The 15,000 user test required an increase of test time to 2 hours to handle the increased user ramp, and it also had increased front-end Web server (WFE) servers to 6 WFEs to handle the increased load. This test series varies the RAM available to Microsoft SQL Server to compare the performance of a SQL Server computer that has a large amount of physical RAM with that of SQL Server computers that have less RAM. 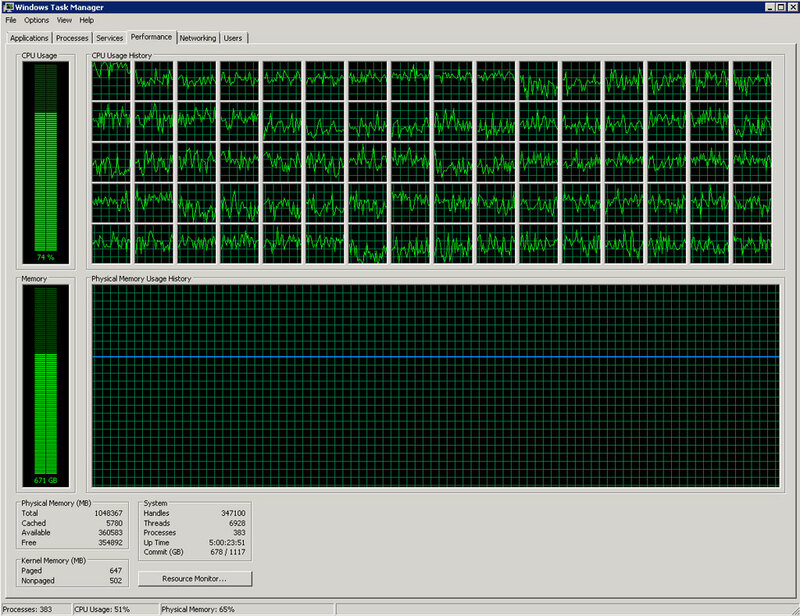 Six tests were performed with the maximum SQL Server RAM set to 16 GB, 32 GB, 64 GB, 128 GB, 256 GB, and 600 GB. This test series varies the proportion of searching done by the test users compared to browsing and opening documents. The test workload that is applied to the farm is a mix of different user transactions, which by default follow the baseline of 30% for Open, 40% for Browse, and 30% for Search. Tests in this series vary the proportion of search and therefore also change the proportion of Open and Browse. This test series varies the RAM allocated to the four front-end Web servers that were used for this test. The RAM on the four front-end Web servers was tested at 4 GB, 6 GB, 8 GB and 16 GB. This test series varies the number of front-end Web servers that are being used. The different number of servers tested was 2, 3, 4, 5, and 6. This test series restricts the number of CPUs available to SQL Server. The different number of CPUs available to SQL Server tested was 2, 4, 8, 16 and 80 CPUs. During each test run, resource usage was captured by using Performance Monitor (Perfmon.exe) and Visual Studio 2010 Ultimate in order to determine the load on the test farm. The following details were captured and are shown in the reports section. The Document Center farm is the host for SharePoint Server Central Administration, Document Center 1, Document Center 2, Service Applications and the integrated FAST Search Center. The farm consists of three physical servers and 22 virtual servers. The following figure shows the physical architecture of the test farm. The following figure focuses on the physical servers in the Document Center farm. Hyper-threading was disabled on the physical servers because additional CPU cores were not needed and were limited to 4 logical CPUs in any one Hyper-V virtual machine. The goal was to avoid any decrease in performance of these servers because of hyper-threading. There were three physical servers in the lab. All three physical servers plus the twenty two virtual servers were connected to a virtual LAN within the lab to isolate their network traffic from other unrelated lab computers. The LAN was hosted by a 1 GBPS Ethernet switch, and each NEC server was connected to two 1 GBPS Ethernet ports. The Windows Domain Controller and Domain Naming System (DNS) Server for the virtual network that was used in the lab. The Microsoft SQL Server 2008 R2 that hosts the master and secondary files for content databases, Logs, and TempDB. 100 FAST Document Processors were also run directly on this server. The Hyper-V Host that serves the SharePoint Server, FAST Search for SharePoint and Test Rig virtual machines within the farm. This test was made possible by the support from Microsoft hardware partners. NEC provided an NEC Express5800/A1080a (GX) server that contains 8 CPUs (processors) and 1 terabyte of total RAM. Each processor contains 8 cores for a total of 64 cores for the server. As detailed below, this server was used to run Microsoft Hyper-V with several virtual machines that made up the SharePoint Server and FAST Search Server 2010 for SharePoint farms. 1 terabyte memory. Each Processor Memory Module has 1 CPU (10 cores) and 16 DIMMs. Intel provided a second NEC Express5800/A1080a server that also contained 8 CPUs (processors) and 1 terabyte of RAM. Intel made additional upgrades to this computer to Westmere EX CPUs, which each contained 10 cores for a total of 80 cores for the server. As detailed below, this server was used to run Microsoft SQL Server and FAST Search Server 2010 for SharePoint indexers directly on the computer without using Hyper-V.
EMC provided an EMC VNX 5700 SAN that contains 300 terabyte of high performance disk. These servers all ran on the Hyper-V instance on PACNEC02. All virtual servers started from VHD files that are stored locally on the PACNEC02 server and all had configured access to the lab virtual LAN. Some of these virtual servers were provided direct disk access within the guest operating system to a LUN on the SAN. Direct disk access that was provided increased performance over using a VHD disk and was used for accessing the FAST Search indexes. The following is a list of the different types of virtual servers that run in the lab and the details of their resources use and services that are provided. The Test Controller and Test Agents from Visual Studio 2010 Ultimate for load testing the farm. These virtual servers were configured to use 4 virtual processors and 8 GB memory. These servers used VHD for disk. APP-1 - SharePoint Server Central Administration Host and FAST Search Service Application Host. These virtual machines host the SharePoint Server Central Administration and Service Applications that used in the farm. These virtual servers were configured with 4 virtual processors and 16 GB memory. These servers used VHD for disk. FAST-SSA-1 and FAST-SSA-2 – FAST Search Service Applications 1 and 2 respectively. FAST-IS-1, FAST-IS2, FAST-IS3, and FAST-IS4 - FAST Index, Search, Web Analyzer Nodes 1, 2, 3, and 4. These virtual machines host the FAST Search Service and Administration. Each virtual machine was configured with 4 virtual processors, 16 GB memory. These servers used VHD for disk. These virtual machines host the FAST Index and the Search and Web Analyzer Nodes that are used in the farm. These servers were configured to use 4 virtual processors, 16 GB memory, and they used VHD for their boot disk. These servers had direct access as disks to 3 terabyte of SAN LUNs for storage of the fast index. WFE-1, WFE-2, and WFE-3 - Front-end Web server #1, #2, and #3, part of a Windows load-balancing configuration hosting the first Document Center. These virtual servers were configured to use 4 virtual processors and 8 GB memory. WFE-4, WFE-5, and WFE-6 - Front-end Web server #4, #5, and #6, part of a Windows load-balancing configuration hosting the second Document Center. These virtual servers were configured to use 4 virtual processors and 8 GB memory. These virtual machines host all of the front-end web servers and a dedicated FAST crawler host within the farm. Each content database contained one Document Center site which was configured to use 3 load-balanced SharePoint Server WFEs. This was to facilitate the text mix for load testing across the two content databases. In a real farm each WFE would target multiple content databases. These servers used VHD for disk. The storage consists of EMC VNX5700 Unified Storage. The VNX5700 array was connected to each of the physical servers, PACNEC01 and PACNEC02, with 8 GBPS Fiber Channel. Each of these physical servers contains two Fiber Channel host bus adapters so that it can connect to both of the Storage Processors on the primary SAN, which provides redundancy and allows the SAN to balance LUNs across the Storage Processors. An EMC VNX5700 array (http://www.emc.com/products/series/vnx-series.htm\#/) was used for storage of the SQL Server databases and FAST Search Server 2010 for SharePoint search index. The VNX5700 was configured to include 300 terabyte of raw disk. The array was populated with 250x 600GB 10,000 RPM SAS drives and 75x 2TB 7,200 RPM Near-line SAS drives (near-line SAS drives have SATA physical interfaces and SAS connectors and the regular SAS drives have SCSI physical interfaces). The drives were configured in a RAID-10 format for mirroring and striping. The configured RAID volume in the Storage Area Network (SAN) was split across 3 pools and LUNs are allocated from a specific pool as shown in the following table. The Logical Unit Numbers (LUNs) on the VNX 5700 were defined as shown in the following table. An additional lower performance disk array was used for backup and to host the bulk Office document content that was loaded into the SharePoint Server 2010 farm. This array was not used during test runs. The logical architecture was defined to demonstrate the recommended limits of SharePoint Server 2010. The architecture consists of two Web applications that each contain a single site collection in a single unique content database. Each content database was loaded with 60 million documents of type Microsoft Word (.docx), Excel (.xlsx), PowerPoint (.pptx) and Hyper-text Markup Language (.html) pages. The average size of the documents was 250 kilobytes (KB). Content database size was approximately 15 TB each, for a total corpus of 30 TB. The logical architecture for the large-scale lab is shown in the following figure. The SharePoint Server Document Center farm is intended to be used in a document archival scenario to accommodate lots of documents stored in several document libraries. Document libraries were limited to approximately one million documents each and a folder hierarchy limited the documents per container to approximately 2,000 items. This structure accommodates the large document loading process and prevents the load time from decreasing after exceeding 1 million items in a document library. The two content site collections took advantage of the Document Center template. The Search Center site collection leveraged the FAST Search Center template. Each site collection was in a unique Web application. Each Web application used a separate application pool. The SharePoint Services IIS Web site hosts the shared services used in SharePoint Server 2010. For the purposes of this lab, the, Secure Store was used. The Central Administration IIS Web Site hosts the Central Administration site and user interface for SharePoint Server 2010. The Document Center 1 IIS Web Site hosts the first Document Center archive. The Document Center 2 IIS Web Site hosts the second Document Center archive. The Fast Search Center IIS Web Site hosts the search user interface for the farm. At 70 million items and above the crawl database started to slow noticeably. Tuning work was required to take it from 100 million to 120 million items. The following SQL Server databases are hosted on the EMC VNX 5700 Storage Area Network (SAN). A Microsoft SQL Server database that stores all report metadata including report definitions, report history and snapshots, and scheduling information. A Microsoft SQL Server database that stores all of the temporary snapshots while reports are running. Crawler store for the FAST Search Query Search Service Application. This crawl store database is used only for user profiles (People Search). Administration database for the FAST Search Query Search Service Application. Stores the metadata properties and security descriptors for the user profile items in the people search index. It is involved in property-based people search queries and returns standard document attributes for people search query results. Crawler store for the FAST Search Content Search Service Application. This crawl store database is used for all crawled items except user profiles. Administration database for the FAST Search Content Search Service Application. Administration database for the FAST Search Server 2010 for SharePoint for SharePoint Server farm. Stores and manages search setting groups, keywords, synonyms, document and site promotions and demotions, property extractor inclusions and exclusions, spell check exclusions, best bets, visual best bets, and search schema metadata. FAST Search Center content database. The FAST Search Server 2010 for SharePoint data directories use a Hyper-V pass through drive directly to the SAN. On the virtual server FAST-IS1, the data directory is using 745 GB of the 3 terabyte and has no temp space being used (temp items were cleaned up). The following table shows the data storage in the FAST Search Server 2010 for SharePoint index file folders that are stored on the SAN. SharePoint Server Relevancy Information, which is used for boosting popular search results to top of list. Boosting search result order for more frequently linked documents. This is the approximate project timeline. To provide a realistic document archive scenario, document uniqueness was very important. Two separate utilities were used: the first to create a large number of unique documents, and the second to read these files from disk and load them directly into targeted SharePoint Server Web Applications and document libraries. Documents were created by using the command-line tool Bulk Loader, which was written using the Microsoft .NET 4.0 Framework. This tool uses a dump file of Wikipedia content as input to enable a user to create up to 10 million unique documents to a disk location. Stock images are used to replace image references from the Wikipedia dumps. BulkLoader is available as source code from http://code.msdn.microsoft.com/Bulk-Loader-Create-Unique-eeb2d084. Documents were added to SharePoint Server by using the command-line tool LoadBulk2SP, which was written using C# and the Microsoft .NET 3.5 Framework to be compatible with SharePoint Server. LoadBulk2SP tool uses the disk output files from the Bulk Loader tool as input and mimics the same folder and file structure directly into SharePoint Server by using targeted web applications and document libraries that are specified in the application configuration. LoadBulk2SP was used to load over 100 million 250 KB documents into SharePoint Serverwith a peak performance of 233 documents-per-second, and an overall average load time of 137 documents-per-second. LoadBulk2SP is available as source code on http://code.msdn.microsoft.com/Load-Bulk-Content-to-3f379974. Documents were loaded by using the LoadBulk2SP tool. This tool uses the SubFolderCollection.Add() method to add new folders to specified SharePoint Server document libraries, and the SPFileCollection.Add() method to add files directly into the document library folders. The folder and file structure that is created in SharePoint Server mimics the output hierarchy that is created by the Bulk Loader tool. The following table shows the size details of each document library content database, including SQL Server Filegroups, Primary and Secondary files that are used in the farm. The following are the details of the document library hierarchies and the total number of folders and documents that are generated by the LoadBulk2SP tool for each Document Center. The totals across both Document Centers are for 60,234 and 120,092,033 files. The total number of folders and files that are contained in each document library in the content database are shown in the following table. Documents were limited to 1 million per document library strictly for the purposes of a large content load process. For SharePoint Server farm architecture results and advice related to large document library storage, see Estimate performance and capacity requirements for large scale document repositories in SharePoint Server 2010, which focuses on the performance characteristics of document libraries as size increases and the throughput of high volume operations. For more information about software boundaries and limits of items in document libraries and items in content databases, see SharePoint Server 2010 capacity management: Software boundaries and limits. The total number of folders and files that are contained in each document library in the content database are shown in the following table. The following table shows statistical samples from the top five test runs of the LoadBulk2SP tool that used four concurrent processes, with each process using 16 threads that targeted different Document Centers, document libraries and input folders and files. SQLIO is a stress tool that is used to determine the I/O capacity of a given configuration. SQLIO was run on the system after performance tests were completed. Therefore, several disks backed by SAN LUNs could not be included as they had too much existing data on them. The SQLIO test runs on each drive letter individually and then runs a test on all drives at one time. You can see the IOPS/GB in the right column, which is calculated by dividing the IOPS by the drive capacity. For these drives all being tested at the same time, 105,730 IOPS was achieved. Performance Monitor jobs were run consistently together with concurrent FAST Indexing, content loading, and Visual Studio 2010 load tests running. The following table reflects the maximum IOPS achieved by LUN and identifies each LUN, and its description, total size, maximum reads, maximum writes, totals IOPS, and IOPS per GB. Because these results were obtained during testing, the results reflect the IOPS that the test environment was able to drive into the SAN. Because drives H:, I:, J:, and K: could be included, the total IOPS achieved was much higher than for the SQLIO testing. Crawling SharePoint Server sites for search is performed by the crawler that is configured to feed to the FAST Content Distributors. The content Search Service Application (SSA) was configured to run on two servers, APP-1 and APP-2, and the query SSA was run on the servers FAST-1 and FAST-2. 100 FAST indexing document processors were run on the SQL Server computer. The following screen from task manager on the computer shows the activity while both document processing and a 10,000 user load test were running with SQL Server on this computer. In order to generate a significant load during testing, the following software was used: Visual Studio 2010 Ultimate, Visual Studio 2010 Load Control, and Visual Studios Agents 2010. A Test Rig is required to simulate many users and produce a significant load. A Test Rig is made up of a Test Controller computer and one or more Test Agent computers. The test controller manages and coordinates with agent computers, and the agents are used to generate load against SharePoint Server. The Test controller is also responsible for collecting performance monitor data from the computers that are under test and from the agent computers. This section identifies the results of the performance test runs. In this test series, the number of users loaded onto the test farm very. The following figure shows the requests per second that the Visual Studio 2010 Ultimate Test Controller was able to process through the SharePoint Server farm during the tests for each of the user load sizes. The chart shows that as additional user load is applied, the requests increase because of the larger user number. When the test reaches 15,000 users, the farm is heavily loaded. Consequently, the requests do not increase as much as the applied load. Because the 15,000 user test took additional time to ramp up, this test ran for 2 hours instead of the baseline of 1 hour. Due to the load, we also found that 3 front-end Web servers were insufficient. We ran this test with 6 front-end Web servers. In the following graph, you can see that test transaction response time increases together with the page refresh time for the large 15,000 user test. This shows that there is a bottleneck in the system for this large user load. We experienced high IOPS load on the H: drive, which contains the primary data file for the content database during this test. This area could have been investigated further to remove this bottleneck. In the following graph, you can see the increasing CPU use as the user load is moved from 4,000 to 10,000 users. CPU use is reduced just for the front-end Web servers (WFEs) as the number of WFEs is doubled from 3 to 6. At the low end of the chart, notice that the APP-1 server has fairly constant CPU use, and the large PACNEC01 SQL Server computer does not reach 3% of total CPU use. The following table shows a summary of data captured during the three tests in test series A. Data items that show “NA” were not captured. In this test series the available RAM to SQL Server is varied. The following figure shows that the requests-per-second was not affected by the RAM allocated to SQL Server. The following graph shows the CPU use for the front-end Web servers (WFE), the App Server, and the SQL Database Server. The three WFEs were constantly busy for all tests, the App Server is mostly idle, and the database server does not increase above 3% CPU usage. The following table shows summary of data that was captured during the three tests in test series B. In this test series, the proportion of search transactions in the workload mix is varied. The following graph shows that test C.5 had significantly longer page response times, which indicates that the SharePoint Server 2010and FAST Search Server 2010 for SharePoint farm was overloaded during this test. The following table shows a summary of data that was captured during the three tests in test series C.
In this test series, the RAM on each front-end Web server virtual machine is varied. The following graph shows that the available RAM on each front-end Web server is always the RAM allocated to the virtual machine less 2 GB. This shows that for the 10,000 user load and this test transaction mix, the front-end Web servers require a minimum of 2 GB of RAM plus any reserve. The following table shows a summary of data that was captured during the three tests in test series D.
In this test series the number of front-end Web servers in the farm is varied. The following figure shows that the average RPS slightly lower with 2 and 3 front-end Web servers as the system does not completely keep up with the applied user load. But with 4, 5 or 6 front-end Web servers, requests-per-second is constant as the system is handling the full load from the test agents. A similar pattern is shown in the following graph where you can see the response times high for 2 and 3 WFEs and then very low for the increased numbers of front-end Web servers. The following graph shows that the CPU time is lower when more front-end Web servers are available. Six front-end Web servers clearly reduces the average CPU utilization across the front-end Web servers, but only four front-end Web servers are required for the 10,000 user load. Notice that you cannot tell from this chart which configurations are handling the load and which configurations are not. For three front-end Web servers, which we identified as not completely handling the load, the front-end Web server CPU is just over 50%. The following table shows a summary of data that was captured during the three tests in test series E.
In this test series the number of CPUs that are available to SQL Server varies. The following graph shows that despite minimal CPU use on the SQL Server computer, the page and transaction response times increases when SQL Server has fewer CPUs available to work with. The following graph shows that the SQL Server average CPU usage for the whole computer does not exceed 3%. CPU usage for the three front-end Web servers was approximately 55% throughout the tests. The following table shows a summary of data that were captured during the three series F tests. After the SharePoint Server 2010 farm was fully populated with 120 million items, SharePoint Server 2010 with SP1 and FAST Search Server 2010 for SharePoint SP1 were applied to determine how long the process would take on a large populated farm. Microsoft SharePoint Server 2010 with Service Pack 1 (SP1) and the June Cumulative Update were applied in the lab to determine a base upgrade time for a large-scale Document Center farm scenario. The following table reflects the servers in the farm that required the SP1 and June CU upgrades, the start and end time of each install, the total time of installs, the start and end time of PSCONFIG upgrade command, the total time of PSCONFIG upgrade command, the total time of the upgrade by server name, and the total installation times. The FAST Search Server 2010 for SharePoint Service Pack 1 (SP1) upgrade required approximately 15 minutes per node to upgrade. A SQL Server database backup was executed on the content database for Document Center 1 (SPContent01). A backup (B/U) was performed pre-SP1, June Cumulative Update (CU), and post-SP1. The following table shows the backup time and size details. The SharePoint Server 2010 farm was successfully tested at 15,000 concurrent users by using two SharePoint Server content databases that included a total of 120 million documents. The SharePoint Server 2010 farm with three front-end Web servers, as was specified in the baseline environment, was not able to support the load of 15,000 concurrent users. Six front-end Web servers were required for this load. The following is a summary list of the recommendations. In each section the hardware notes are not intended to be a comprehensive list, but to indicate the minimum hardware that was found to be required for the 15,000 concurrent user load test against a 120 million document SharePoint Server 2010 farm. Reduce table index fragmentation issues manually during bulk document import by running ALTER INDEX on the affected table indexes. Prefer SPFileCollection.ADD for bulk import of documents over creating duplicate documents by using SPFolder.CopyTo. Make sure all indexers are reporting to see how many documents are indexed in 1000 milliseconds. This number ran from 40 to 120 depending on the type of documents being indexed at the time.